The purpose of this video is to teach you how to make music with Ableton Live. You can also buy a version of the video that includes one hour of personal help/tuition; see the video + tuition option. In this video, Fanu – an Ableton Certified trainer and a producer with nearly 30 years of electronic music experience – shows and explains Ableton Live’s central concepts and tools. After learning these concepts, you can easily make your own music with Ableton Live using its samplers, synths, and effects. You’ll learn to play, record, and edit music and audio material. The most important tools, instruments, and effects are used and explained, so you will learn the basics you need to make music with Live. This should get you motivated and curious and expand your learning – and you’ll be a music-maker using Live in no time. 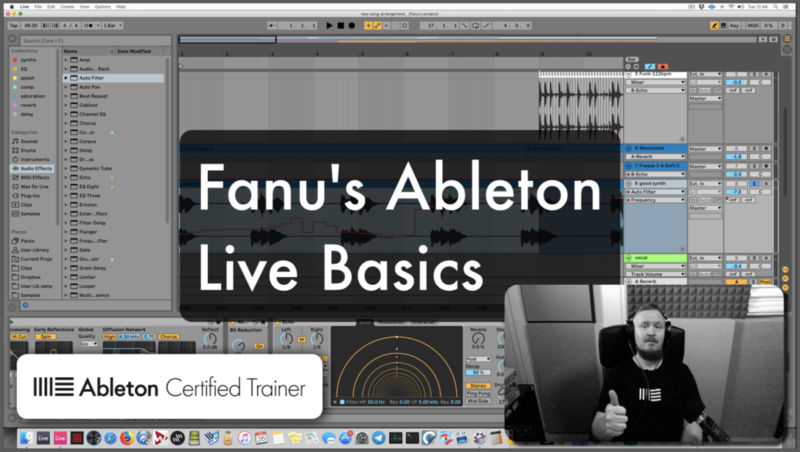 Video is suitable for both beginners as well as more experienced DAW users who want to grasp how Ableton Live works. The video is not a song-writing help video, but rather a video that helps you to understand how to use a very popular music-making tool. Several musical concepts (e.g., song section lengths) are discussed on the side. This is not a video that explains all electronic music basics in general. The video (split into three video files) lasts 4.5 hours and shows a session where Fanu works on a simple 2-minute song while covering everything that is essential about Ableton Live. Everything you need to understand about making music effortlessly with Ableton Live is covered by the video. A video with an abundance of advanced topics will come later and will be useful to those who have grasped the content in the Basics video. The main points of the video are listed below. There is way more information in the video than just the points below, and many of the tips and tricks kind of overlap with and appear ”between” the main topics. • Paying for the product activates video file download. Download link will be active for three days. Do NOT buy before you are ready to download. You and only you are responsible for downloading the file(s) before the links expire. • All sales are final: NO refunds. • Read about content above before purchase. Questions about content? Email Fanu. • This purchase does NOT include tuition or support regarding the use of Ableton Live to any extent. If you want personal tuition or assistance, buy the option with one-hour personal tuition from the webshop.